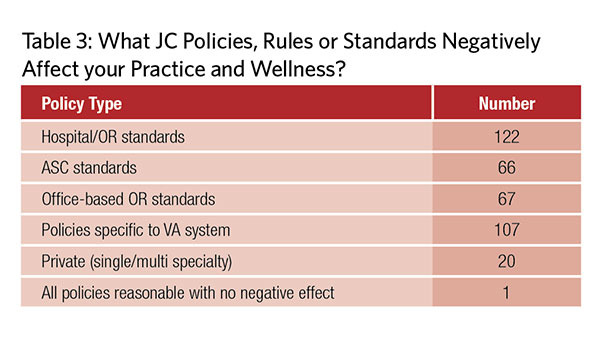 The direct relationship between policies and rules that are perceived as burdensome, inappropriate, and unnecessary and the overall wellness of the physician community has been established multiple times over the last five to 10 years. Otolaryngologists are not immune from this phenomenon and may be near the front of the line when it comes to the “danger level” caused by an increasing series of both in-office and facility-based requirements related to instrument cleaning, packaging, and storage. This topic generates a great deal of discussion on ENTConnect and elsewhere. To identify and clarify the specific issues and concerns affecting our members and their patients, we sent out a short survey of six questions through multiple media avenues. 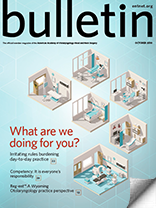 The questions covered type of practice setting; what policies, recommendations, rules, or standards negatively affect your practice and how; the most onerous requirements as they apply to your practice, including specific examples; and estimates of the additional cost to your practice for compliance with these rules. We received 158 detailed responses in the first 10 days. After collating the answers to the survey, we were able to obtain an audience with The Joint Commission, led by its Director, David Baker, MD, with the aid of Russell W. H. Kridel, MD (AMA, Trustee), Helen Burstyn, MD (CMSS, EVP) and Jay Randolph, MD (General Surgeon member of the Joint Commission). We had previously provided them the results of our survey via teleconference on June 18, 2018. We discussed the results of the survey and major areas of concern by our members. The Joint Commission addressed each of these issues individually through thoughtful discussion. The survey represented all major practice types in our specialty (Table 1). 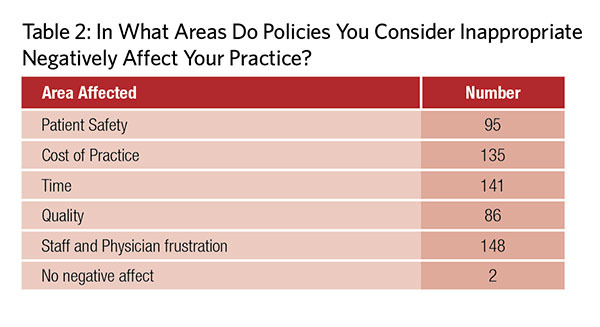 The responders described how policies affected the different areas of their practice, as noted in Table 2. They also looked at the major consequences of these policies in Table 3. Finally, Table 4 ranks the most onerous requirements to their practice. The Joint Commission response was very encouraging, both in the willingness to listen and discuss the matter with us and with the results of the discussions. They suggested that they produce a perspective article for their September bulletin, which would include clarifications related to the issues we discussed. They also agreed to do an online FAQ clarification of their policies and discuss them with their surveyors. Additionally, they suggested setting up a hotline for physicians to directly report areas of concern that they feel are not achieving the stated goal of the policy. Subsequently, we received a letter detailing The Joint Commission responses to the areas of concern raised in the survey in August (Points from it follow). 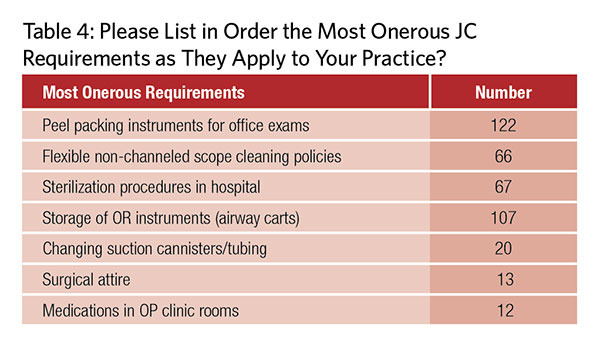 The specific areas in which they offered comments addressing the situations identified in our survey include the peel packing of instruments in the office setting; the methodology for cleaning non-channeled endoscopes; the storage of OR equipment in airway carts; and OR attire, which represent the most commonly cited concerns. We appreciate the work that C. W. David Chang, MD, representing the PSQI committee (recently selected as a “Committee of Excellence” award winner for 2018) put into this project. This is an example of how groups working together addressing a problem from multiple perspectives can facilitate change and improvement in existing policy. As you can see, these comments clarify policy and recommendations in areas that are clearly “pain points” for our members and supporting staffs, both in the private and academic sectors. The results of these interpretations—particularly as related to “peel packing” of instruments both in the office and hospital setting, sterilization requirements for non-channeled endoscopes, and storage of operating room instruments (airway carts)—would seem to offer significant relief in financial terms, physician and staff frustration, time management, and patient safety. One of the questions on the survey asks each participant to estimate the cost to comply with their current situation as dictated by policies and rules they are subject to. I realize that this is a small sample size and that monetary costs were presented as estimates and not audited amounts. But I feel it is still possible to present a reasonable estimate as to a per-physician benefit that the above-mentioned policy changes represent. Those respondents in private practice and those whose office-based policies are controlled by a hospital system could reasonably expect savings of $5,000 – $15,000 per physician per year, based on the “peel pack” and sterilization changes alone. The time savings and reduced physician and staff frustration is likely incalculable. Finally, one saved life in an emergent airway situation is priceless. I want to personally thank everyone who participated in the survey that allowed us to make a difference in your day-to-day practice. We will continue to do our best to help overcome or eliminate barriers you encounter that limit your ability to deliver the highest quality medicine to your patients. The Joint Commission does not have a requirement that instruments that will touch mucous membranes be individually peel-pouched. The minimum standard for instruments that will touch mucous membranes but will not penetrate the mucosa is high level disinfection. However, so as not to have to meet all of the requirements for high level disinfection of instruments and to be able to wash and process in batches, many facilities have decided that it is easier to sterilize these instruments and place them in peel pouches to ensure that they are kept clean during distribution to clinical sites. The minimum storage requirement for items that will touch mucous membranes is storage in a manner that will prevent contamination. Therefore, if sterilized instruments are distributed in peel-pouches, they can be opened and distributed to multiple clean drawers. The Joint Commission does not have such a requirement. The FDA, CDC, Association for Medical Instrumentation (AAMI), The Joint Commission and multiple other organizations have all emphasized the importance of carefully following manufacturer instructions for use when reprocessing any endoscope in order to protect patients. In order to ensure the safest possible equipment is used on patients, it is the expectation of The Joint Commission that facilities will follow manufacturer instructions for cleaning all endoscopes regardless of the presence of lumens. This includes the manufacturer’s instructions for the endoscope (pre-cleaning at point of use, leak testing, cleaning, high level disinfection, rinsing, and drying) and associated cleaning products and equipment. 3. Requiring facilities to define a maximum allowable time before endoscope reprocessing is needed. Thank you for bringing this issue up. We have reviewed the current practice of requiring facilities to define a maximum allowable time between endoscope reprocessing. We have found no increased risk related to storage time as long as manufacturer instructions were followed. Therefore, we are instructing the Joint Commission Surveyors to not score if the facility has not reprocessed an endoscope that has been stored, unless the endoscope is visibly soiled or dusty or the manufacturer specifies a maximum “hang time.” We are in the process of educating surveyors on this change. The Joint Commission recognizes that flash sterilization is often necessary when an instrument is contaminated during a procedure. However, we will cite facilities if they are using Immediate Use Steam Sterilization routinely (e.g., in non-emergent cases). As stated above, instruments must be stored in accordance with their intended use. Items that will come in contact with mucous membranes but will not enter sterile areas or tissue must be stored in a way that maintains cleanliness after disinfection. It is acceptable to store these types of instruments that have been high level disinfected or sterilized (for convenience) in a cart or cabinet for emergency airway access. The Joint Commission does not have a requirement for bouffant hair covering. We have reviewed studies sponsored by the American College of Surgeons showing that these do not offer greater protection than the traditional surgeon’s skull cap, and they may actually be worse. Surgical attire is often governed by State Department of Health (e.g., licensing) rules and regulations. Facilities should ensure that they are compliant with any state regulations. In the absence of state regulations, facilities should ensure that they follow CMS requirements that surgical attire (e.g., scrubs) be worn and all head and facial hair be covered by personnel entering semi-restricted or restricted areas. The Joint Commission evaluates medication vial storage based on guidance established by CDC guidelines related to safe injection practices and in accordance with key stakeholders requirements (CMS). Multi-dose vials should be dedicated to a single patient whenever possible. If multi-dose vials must be used for more than one patient, they should only be kept and accessed in a dedicated mediation preparation area (e.g., nurses station), away from immediate patient treatment areas. This is to prevent inadvertent contamination of the vial through direct or indirect contact with potentially contaminated surfaces or equipment that could then lead to infections in subsequent patients. If a multi-dose vial enters an immediate patient treatment area, it should be dedicated for single-patient use only. However, based on your questions, we revisited the CDC guidelines and have identified some practical limitations and barriers to healthcare providers complying with the CDC recommendations. We have attempted to contact CDC to discuss this issue, but we have not yet been able to do so. We will continue to work to get our questions answered, and we will update you when we do and notify you of any changes in our survey policy.